If you enjoy simple slots with colourful design and a collapsing reels game engine, then Casumo Casino is the place to be as it has just launched Push Gaming’s new Jammin’ Jars slot. The bright and breezy looking game from Push Gaming is played on an unusual 8×8 grid. Winning combinations are created by landing clusters of 5 or more matching symbols. There are 6 of those fruity symbols – blueberries, plums, apples, raspberries, oranges and strawberries. There’s a huge range in the potential prizes on offer here. Awards start at just 0.1 times your stake if you land 5 of the lowest value blueberry symbol in combination. That can rise to 100 times your stake if you find 25 or more strawberries. Jammin’ Jars is played using collapsing reels so the successful symbols are removed following a win and new ones drop in and replace them. These continue until there’s a collapse where no new winner is created. Keep a special eye out for the wild jam jars. If these form part of a winning combination, they move to an adjacent position before the next collapse occurs. The jam jars also increase a multiplier by 1 every time they’re part of a winner. All jam jars anywhere on the reels lock in place for the collapse that follows. Hope to see 3 of the jam jar wild on the same spin as it triggers the Free Games feature. Here you can look forward to a random number of free spins. You’ll see 3 wilds added at the start of this round. These wilds are in play throughout your free spins and comes with wilds attached which can increase if you get on a roll with the collapsing reels wins. Collapsing reels slots can be a bit of an acquired taste. Not everyone is a fan of the rather repetitive gameplay. If you do enjoy this type of game, then you should find plenty to like in Jammin’ Jars. The colourful design is impressively done and the wilds with multipliers can deliver some potentially exciting action to the tune of 20,000 times your stake! 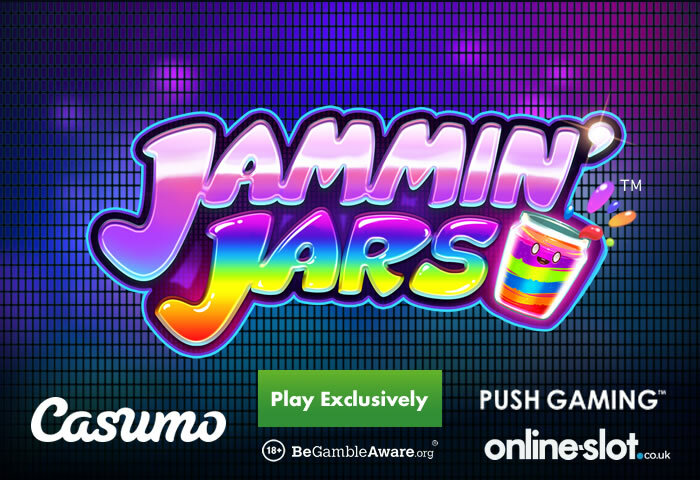 Take Jammin’ Jars for a spin exclusively at Casumo Casino. If you haven’t got an account, you’ll have the pick of over 850 titles to choose from. They’ve added an ‘Only at Casumo’ section too where you can find their exclusive releases such as Lightning Box Games’ Astro Pug and Thunderkick’s Jaguar Temple. Also on offer is a welcome package that includes 20 no deposit free spins on NetEnt’s Starburst and a 100% bonus worth up to £300. 18+, New Customers Only. T&Cs apply. www.begambleaware.org.